Author Jodi Sackman’s newly released “Called to a Life of Pain For His Glory: A ninety day devotional for anyone living a life of pain” is a guide to chronic pain. 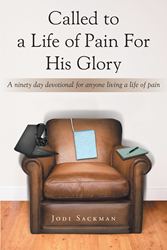 “Called to a Life of Pain For His Glory: A ninety day devotional for anyone living a life of pain” from Christian Faith Publishing author Jodi Sackman is a spiritual guide for those suffering from chronic pain. Through her own experiences as someone suffering from the chronic pain of fibromyalgia, Jodi has learned that pain can give purpose. “Called to a Life of Pain For His Glory: A ninety day devotional for anyone living a life of pain”: an open and honest discussion on chronic pain and faith. “Called to a Life of Pain For His Glory: A ninety day devotional for anyone living a life of pain” is the creation of published author, Jodi Sackman. teacher, mentor to several girls, and student of God’s Word. Jodi is a pastor’s wife, mother of three, and yaya of eight. Rounding out her family is a donkey, a neurotic pony, a goat, and two boxer dogs. She enjoys reading, sewing, and crafting. Published by Christian Faith Publishing, Jodi Sackman’s new book teaches the purpose of pain. Everyone experiences pain at one time or another. For some, a few days of pain turn into weeks, months, years, and even decades. As someone who has had to learn to live with the chronic pain of fibromyalgia, Jodi Sackman understands those who struggle with chronic pain. In “Called to a Life of Pain for HIS Glory,” she shares the life lessons Abba taught her. “Called to a Life of Pain for HIS Glory” is a call to arms for those who are hurting. Serious at times and humorous at others, Jodi Sackman offers her honest insights into chronic pain. Everyone matters, and everyone can make a difference in God’s kingdom. Pain is not a curse. It is a purpose. View a synopsis of “Called to a Life of Pain For His Glory: A ninety day devotional for anyone living a life of pain” on YouTube. Consumers can purchase“Called to a Life of Pain For His Glory: A ninety day devotional for anyone living a life of pain” at traditional brick & mortar bookstores, or online at Amazon.com, Apple iTunes store, Kobo or Barnes and Noble. For additional information or inquiries about “Called to a Life of Pain For His Glory: A ninety day devotional for anyone living a life of pain”, contact the Christian Faith Publishing media department at 866-554-0919.